Philadelphia’s David Thomas Tours and Travel added a new Temsa TS35 coach to its fleet. The TS35 coaches are equipped with a Cummins ISL 345 HP engine, Allison B500 transmission and three-point seat belts. 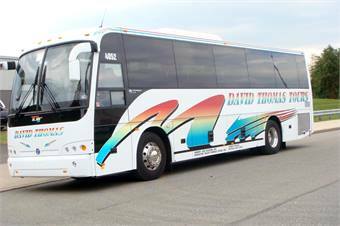 The David Thomas Tours coach is also equipped with REI audio/video, Alcoa rims and 110-volt plug outlets. The Temsa TS35 is a fully integral mid-size coach that offers a luxurious and spacious interior for passengers and driver. It is constructed from stainless steel for extra durability and safety. An American driveline is combined with superb European quality and craftsmanship to create a high quality driving experience. CH Bus Sales is the exclusive distributor of Temsa motorcoaches in the U.S. CH Bus Sales is a privately owned corporation with an industry experienced ownership and management team.